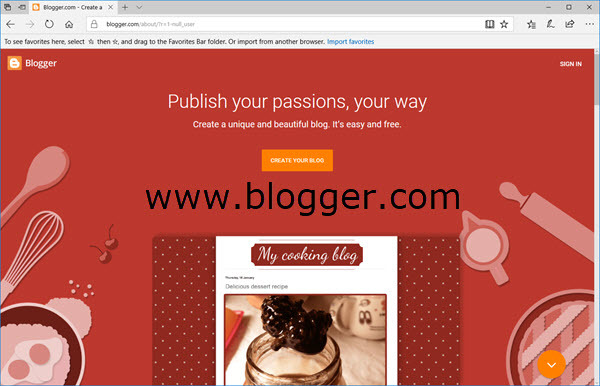 Blogger was launched in 1999 by Pyra Labs as a free blog-publishing service. When Blogger got ever popular, Google purchased it in 2003. Since then, Blogger became the Google Blogger, one of the most widely used free blog-publishing platforms. Google Blogger is a web-based platform; all you need is a Google account. You don't need a web hosting service, because your blog is hosted by Google. You don't need to set up any software, because Google Blogger already configured it on Google servers. You don't need to worry about internet performance, system upgrade, or data security, because they are all taken care of by Google. Now let's take a look of some of the unique advantages offered by Google Blogger. Blogger is one of Google services; if you have a Google account, you are in. There is no need to set up separate Blogger account. Under the Google care, it is easy to integrate other Google services such as Google Analytics, Adsense, and Google+ into Blogger. Google as the internet giant is proven to provide reliable services. Since the Google acquisition, Blogger is much stabled while new features are added over the last decades. Thus, Blogger is expected to be around for a long time. While many blog services come and go frequently, the risk of Blogger disappearing is very low. Google Blogger is free. While, Wordpress.com is free too, one may argue. But the fact is, Wordpress.com is not free; it merely offers a "Basic" free account. Wordpress.com's free account is very limited, making it not much useful. A fee account like this is just to introduce you to monthly paid plans, from $3.99/month Personal Plan to $24.92/month Business Plan. In Google Blogger, there are no plans, - there is no "basic" plan to lure you to the door, and there is no "premium" plan to take your money. What you get is the whole Google Blogger that everyone else gets as no one has to pay a penny. Thus, in the Blogger world, free means free. Although Google Blogger lacks some of the advanced features offered by Wordpress, it is still a robust blog engine to support both personal and professional blogging. There are only two free blog services that allow you to use your own top-level domain on your blog website, - Google Blogger and Tumblr. The free Wordpress.com account only gives you a subdomain like yourblog.wordpress.com. Google Blogger sets you up on a blogspot.com subdomain too, for example, easyblogwealth.blogspot.com is the default URL of this blog. Moreover, Blogger allows you to port the top-level domain, easyblogwealth.com, to the blog, thus all blog posts and pages are served from the www.easyblogwealth.com website. Having your own top-level domain name is definitely needed for professional blogging. With each Google account, you can set up many Blogger sites. In fact, you can have up to 100 blogs. Each blog can have a custom domain added. Thus, you may build 100 websites for free with each Google account. Need more than 100 blogs? Create another Google account free and keep blogging. But 100 blogs are really enough for either personal use or professional money-making blogging. The multi-blog feature is important for blog monetization. To attract traffic and increase advertising impression, a blog needs to be narrowly focused on a few keywords in a niche market. For example, if you have interest or expertise in areas of yoga fitness, database systems, and organic gardening, you may want to create one blog of each area with the target keywords. Thus, Google Blogger comes handy for you to set up three blogs easily, one for each area. It would be a bad idea to blog all the three topics in one site, since they are not conceptually related. For each Blogger site, you can add more authors. You can give the added user the admin permission that you have, or you can just give the user the author permission, allowing the user to post and update his or her own posts. This feature is crucial for bigger blogs that require collaborations among multiple team members. Using the multi-user function, you can invite guest contributors to post on your blog. This could enrich your blog contents without adding much of your own efforts. You may also manage paid posts for making extra money. While these options have pros and cons that you have to evaluate carefully, the Blogger platform is able to support them if you decide to implement these options. Google Blogger has an "Earnings" function to let you easily integrate Google Adsense into your Blogger site. Adsense is one of the Google services that you can enable within your Google account. In Blogger "Earnings" setting, you just add your Adsense Account ID and Client ID, then you can add Google Adsense ads to your blog's sidebar and between posts.